I'm pretty sure hunting for the perfect Markdown editor is a curse cast upon me by some wicked software fairy. I've long since lost track of all the ones I've tried. I've liked some of them, disliked more than a few, but for some reason, I never really stick with any particular one. The developers of Caret have so far issued 22 release candidates for version 4. I figure that by now they must be getting close to releasing a well-polished product and that now's the time to take a close look at the app. Could Caret be the one? Cross-platform availability is an absolute requirement. Preferably on both desktop and mobile operating systems, but it should at least be available on Windows and MacOS. The app should not use proprietary file formats or stuff documents into a database, making the files unavailable to other applications. It needs to launch quickly, and always feel responsive while writing. It must allow me to keep more than one document open at once, or provide a fast way to switch between files. It should look nice and have sane defaults, but also provide some customisation options. Keyboard shortcuts for frequently used commands, don't make me reach for a mouse while writing. So how does Caret fare then? It starts pretty well in that it works on all the three most popular PC operating systems; Windows, MacOS and Linux. On the other hand, it does not run on any mobile platforms. It would have been nice to have Caret running on phones and tablets, but it's not quite the deal-breaker it once could have been. The application works with plain text files instead of using a database, and because of this, there are ways to work around the issue. If you save the files to iCloud, Dropbox, OneDrive or a similar service, you can open your files in any of the many available text editors on iOS or Android. My workflow at the moment is to use Working Copy, GitHub and iA Writer to keep everything in sync and under version control. Thank you to MacStories for the tip! Have you ever used Sublime Text or Visual Studio Code? If you have, you know how helpful the command- and "Goto Anything" palettes are. Caret implements something very similar; it even uses the same keyboard shortcuts. Just hit CTRL+P to jump between open documents, and CTRL+Shift+P to use any of the commands available in Caret. It even uses fuzzy search, which helps speed up finding just the command you're looking for. 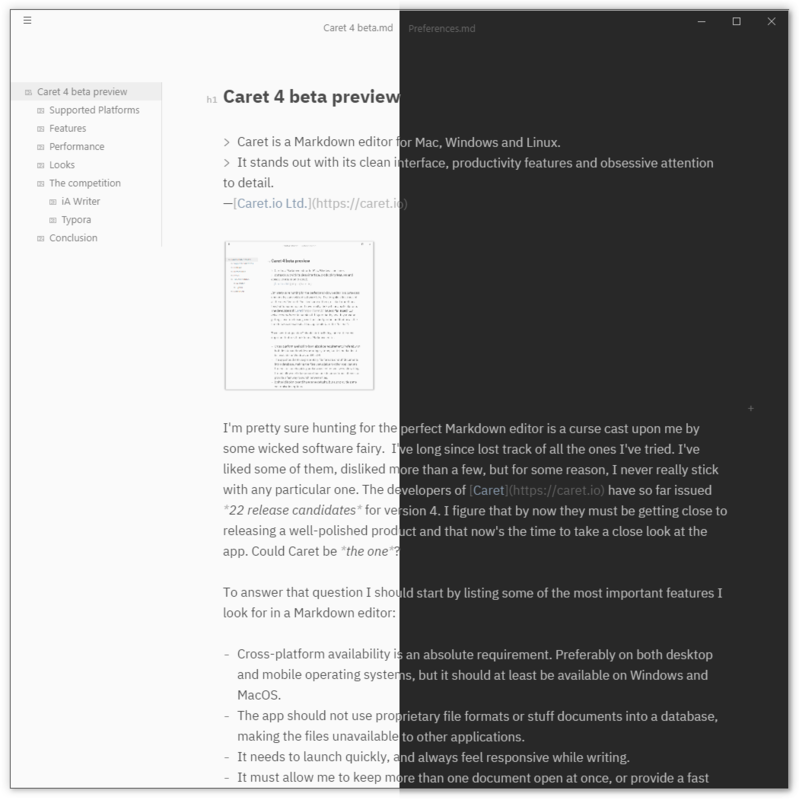 As with most Markdown editors, you can export to both HTML and PDF, but Caret offers no way of tweaking the output when exporting. For HTML exports this means that any images you may have used in your documents will be missing unless you save the exported HTML-file in the same folder as your Markdown document. As for exporting to PDF, Caret insists on making the first page "special," resulting in strange looking documents unless you create a front page. Both of these issues must be solved before I can make regular use of the export functionality. Caret also is aware of files under Git version control. When you add passages in documents, additions since your last commit is marked with a "+" in the right-hand margin. Changed lines are marked with "~", and deleted sections with a "D". This feature is very convenient, especially when working with longer documents. There's currently no way to commit, push or pull changes to or from a repository, but perhaps this is something we'll get in a future release? Performance is essential for any Markdown editor. If it's slow then what's the point? Caret isn't the fastest application I've used in this category, but it doesn't feel sluggish either. As an application built using NodeJS & Electron, I would never expect it to match the speed or feel of native software. The only feature that performs poorly is the spell checker, at least on Windows. I think this is a bug because at times the spell checker can pop up with suggestions a minute or so after I've spelt something wrong. Another issue that popped up while writing this preview of Caret 4 was random crashes. The application stopped responding for no apparent reason, usually while saving. So far these crashes have not resulted in lost content, but I don't trust that this can't happen. Be careful while using the beta version, you may want to wait until the final build is released. First impressions very much matter when there are several good looking competing applications available, for free. Caret doesn't disappoint, but it doesn't quite manage to stand out in a crowd either. The app has a very minimalist look, and if that's your cup of tea, then Caret should be right up your alley. Out of the box, you get a bright and dark application theme and three preview themes. You can add custom preview themes if none of the included ones is to your liking, but there's no apparent way to add application themes. This lack of UI customisation is something of a disappointment, as there are a few things I'd like to change. The main complaint I have is that the tabs are not distinctive enough. They do not have anything separating them aside from a little space, and the contrast between active and inactive tabs isn't sharp enough. This issue makes it challenging to determine which document is active, and I'm hoping the developers can add a higher-contrast theme for the final release of Caret 4. I would also like to see a few more settings for tweaking font sizes in the UI itself. The font size used for the tabs and sidebar is a little too small for my liking, making the application slightly tricky to use unless your eyesight is 20/20. Adding more unique icons in the sidebar would also have helped because currently, it's tough to pick the right document if you are working with a folder containing several different file types. Now that I have given Caret 4 a try for some time, it's time for me to decide if I'll keep using it. I will keep the app installed, and keep giving it a try as they get closer to release. The application looks nice and is for the most part enjoyable to use. The Git functionality differentiates it from many of the competitors, and it's something I hope can be expanded upon in the future. What may keep me from using it day-to-day right now is the bugs. I was planning on writing this preview in Caret solely but had to give up on that in the end. The random instability and the broken spell-checker made writing more difficult than it had to be. That said, there's no reason to think that any of these issues will remain in the final release. When the bugs are solved, I can see myself incorporating Caret in my workflow. Caret 4 beta releases can be download from GitHub. If you decide that you want to purchase a license, it can be bought for $29 USD directly from the developers. There's no lack of great Markdown editors available on MacOS, but on the Windows side, things aren't quite as rosy. Many of the apps available on Windows lack the polish you tend to see on MacOS, or they have been abandoned years ago by the developers. Below I'm listing a couple of the ones I think are good, and available cross-platform. iA Writer is probably one of the better-known Markdown editors out there, thanks to its focus on distraction-free writing, unique typographic choices and early start on iOS back in 2010. It's a mature and well-polished product, and since 2018 it's also available on Windows in addition to MacOS, iOS and Android. iA Writer keeps distractions to a minimum and offers very few options to customise the app. This may come as a blessing or a curse, depending on what you're looking for. I find myself thinking it's the former. I don't mind as much that it offers few options, provided the defaults are as well thought out as this. The Windows version is not yet as fully featured as the iOS or MacOS versions, but it's fast, very reliable, and under active development. iA Writer is an excellent choice for most people unless you need a free alternative, or a Linux version. Typora is, in my opinion, one of the better Markdown editors available regardless of price. It available for free, and runs on Windows, MacOS and Linux. Just like Caret, it's built on NodeJS and Electron. This means it's not as fast and responsive as iA Writer, but just as with Caret, you may not notice. The perceived speed really depends on how fast your computer is. In any case, it should feel no heavier than Caret does. The look of the app can be customised using the same style sheets as used for previewing Markdown, and there are several really good ones available for download on the developers theme site. My only real issue with Typora is that it hides the Markdown syntax as soon as you've written it. Doing things this way has its advantages, but it also makes it easy to focus more on the look of your document instead of the content. Typora doesn't quite manage to feel as polished as some of the commercial competitors, but for the price, it's very hard to beat.